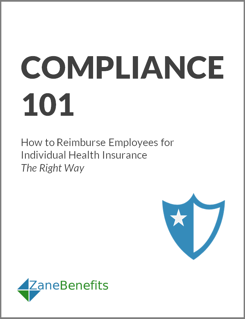 Zane Benefits, which provides small businesses with simple and friendly healthcare solutions, announced today the publication of a new eBook “Compliance 101.” The new guide helps businesses and health insurance professionals understand the compliance behind reimbursing employees tax-free for individual health insurance. According to Zane Benefits, small businesses want to offer employee health benefits but the cost of traditional group health insurance is unsustainable. Additionally, there are new advantages to individual health insurance such as choice, portability, guaranteed-issue, and lower costs. These factors leave small business owners asking "Can I reimburse employees for individual health insurance?" And, “Can we do this tax-free?” As the eBook outlines, the answer to both of these questions is yes. CEOs, CFOs, HR managers, insurance professionals, and CPAs should download this new guide to learn how to set up and administer a compliant and tax-preferred premium reimbursement program. Zane Benefits, Inc., a software company, helps employers, insurance brokers, and accountants take advantage of new defined contribution health benefits via its proprietary SaaS defined contribution software ("ZaneHealth"). Zane Benefits does not sell insurance. Using Zane’s platform, insurance professionals and accountants offer their clients a custom defined contribution plan. Learn more at www.zanebenefits.com.